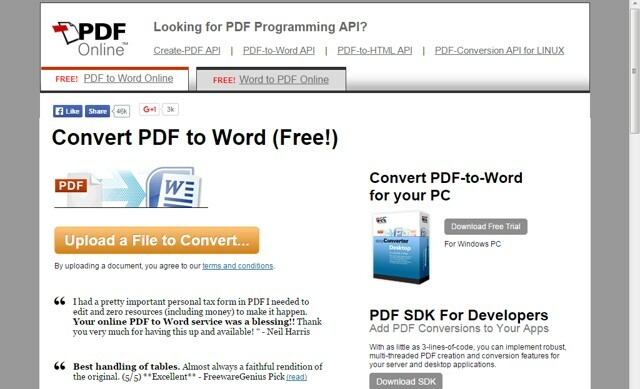 TRP Guides: How to Convert PDF to Word Document Online for Free? PDF files are one of the most used document format at both personal and business level. PDF files retain the formatting and visual appearance of every file, making it perfect for manuals, publications and forms, etc. Furthermore, it is also really hard to edit a PDF file, adding a layer of protection to official content such as statements, comics, accounts and graphic intensive content. However, PDF is not the only acceptable format, Word documents are also equally popular and used widely by businesses and for personal use. So it is quite common to end up in a need of converting PDF to Word and vice versa. Why Convert PDF to Word? Why Convert PDF to Word Online? How to Convert PDF to Word Document Online? There can be many reason why you may like to convert a PDF to Word, but the most common one is the need of editing it. Word makes it extremely easy to to edit a file in any way you like, so converting a PDF to Word makes it extremely easy to edit the content and then convert back. Furthermore, you might be forced to submit a Word document only, so converting your PDF file to word will surely help. A PDF file can be converted to Word using different methods. You can easily convert a PDF using a desktop app, online service and even PDF editor itself (like, Adobe Acrobat). However, an online service has many different advantages, which may entice you to opt for it. You won’t have to download any software in your PC, perfect for people who are a bit concerned about their PC getting infected. If you are not allowed to download software on a PC (restricted by an administrator), then converting online will be a lifesaver. As the conversion is done online, you are not limited by which Operating System you are using. You just need a browser, whether it is on Windows, Mac or Linux. It also has some disadvantages like, you can only convert online if you have a stable internet connection, no offline conversions. Additionally, if you have a slow connection, the speed of the whole process will also be affected. Also Read: Electronic Signature in Word: How to Insert Digital Signature in Word? Now let’s see how you can convert a PDF document to word using some reliable online services. Most of these services will also let you convert Word to PDF, so if you find the need, just refer to the below mentioned services. Convertio is one of the best conversion tools, it is very feature rich and completely free to use without any limitations. It is actually a robust conversion tool that will let you convert different types of files like, Image, Audio, Video, Document, EBook and Archive. Along with all these options, it also supports PDF conversion to Word formats like Doc or Docx. Convertio also integrates with Google Drive and Dropbox to upload and save files directly to these cloud services. To start converting, navigate to the Convertio.co (link shared above) website and hover your mouse cursor over “Select files” button in red. Now you will see some options below to upload files. You can upload files from your PC, URL or one of the supported cloud storage services. If you want, You can add multiple files as well. Once the files are added, you will see all of them in a list with a drop down menu next to them. You can use this drop down menu to specify which format you would like to convert the uploaded file. In our case, it should be “Doc” or “Docx (newer version)” to be acceptable by Microsoft Word. Click on the drop down menu and then click on “Doc” or “Docx” in the “Document” option. Before starting the conversion process, you can specify how you want to receive the file. You can either send the file directly to your Google Drive or Dropbox account. Convertio also allows you to send the link to download the converted files to your email. However, it is not compulsory to select these options as you can still download files manually once they are converted. Now just click on the big “Convert” button and all the files will start uploading and then converting as soon as they finish uploading. All the converted files will have a “Download” button next to them, click on it to download the file. If you have converted multiple files, then you can also download all of them as a ZIP, perfect for saving space and avoiding clutter. Convertio will also remember all your settings (using cookies), so when the next time you want to convert any file, it will automatically set the formats to save your time. If you are not comfortable with Convertio, then there are tons of other online PDF to Word conversion tools as well. 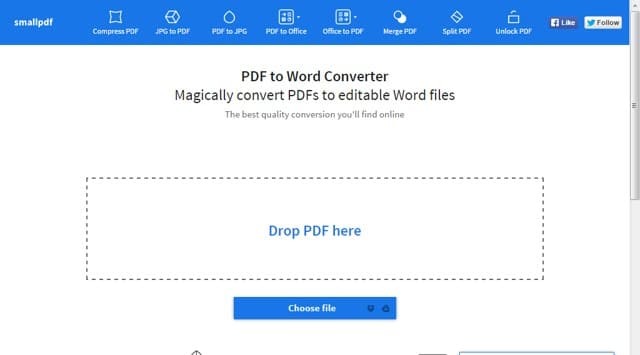 Below are some of the best PDF to Word converter tools. 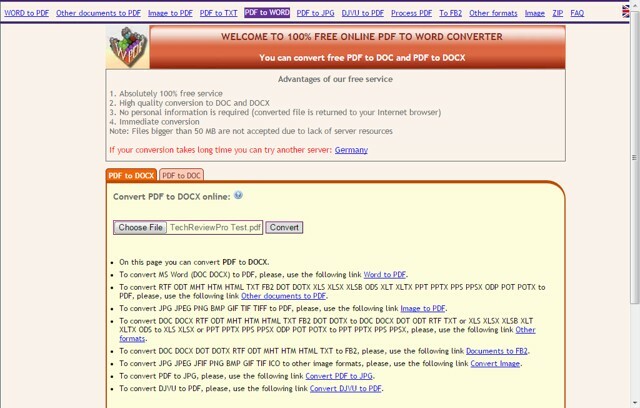 PDF Online is another popular site for converting PDF to Word for free. Its simple interface and fast conversion makes it perfect for novice users. All you need to do is upload the file and PDF Online will automatically convert it and show you a preview and options to download the file. You can both download a Word version and also a HTML version if required. However, it doesn’t support multiple files, so you will have to go for another service if you have too many PDF files to convert. It also offers Word to PDF conversion, if you need to switch back, you can also do so from the same website. A really good free PDF converter that offers a little bit more control over your file than PDF Online. You are able to choose whether you want a Doc file or Docx file, and the process is also very simple with just upload and convert. You are only limited to file size of 50MB and below due to server resources, but for most people it should be enough. Here, you are also limited to only converting one file at a time, although, conversion is quite fast and instant download as soon as the file is converted. It also has some other PDF conversion options like, Word to PDF, PDF to TXT, PDF to JPG and any Image to PDF. docs.zone is another good conversion tool that supports PDF to Word conversion. The tool will let you upload and convert multiple PDF files to Word, which can be a good alternative to the above mentioned tools. It has total 3 modes of conversion, Flowing, Exact and OCR, perfect to fulfill different needs. It has a paid subscription of $9.95 that will offer all these features for unlimited use. You can subscribe for a whole year to get a 50% discount on the subscription. Some of its other conversion options are, Combine files to PDF, Web to PDF, PDF to Excel, PDF to Image and convert files to PDF. Small PDF is a free and feature rich conversion tool, but it is only limited to conversion of one file at a time. It integrates with Google Drive and Dropbox as well and makes sure your files are safe by deleting them permanently after one hour of conversion. You can upload the files from your PC or from one of the supported cloud services. Furthermore, You can both manually choose the file or drag and drop the file in the main interface. File conversion is one of the most used features at both corporate and personal levels. This especially applies to PDF to Word conversion as editing a PDF is a common task. Converting PDF files online is definitely the best way to convert PDF files for most people due to ease and reliability. The above instructions and tools should be more than enough to satisfy your needs. We will recommend Convertio as it is quite feature rich, but other tools are worth a look too. If you need help with anything or would like to share your opinion, let us know in the comments below. How to Reveal Password Hidden Behind Asterisks in Any Web Browser?